Set over three floors with most of the outside and inside living accommodation over the elevated ground floor. The upper ground floor has three bedrooms en-suite, a large dining area and connecting lounge large open fireplace & fantastic modern kitchen fitted with all possible appliances. All terraces, Heated swimming pool & sauna, outside kitchen and BBQ area are also on the ground floor. The whole of the first floor is taken up by the master bedroom suite with en-suite bathroom, dressing room and living room. The ground floor has a separate two bedroom apartment, wine cellar and games room / pool / table tennis & bar area. The built area of the villa is 475 sq metres, plus sq 100 metres of covered terraces and a further 150 sq metres of open terraces. The best location in Mallorca, near golf, sea, many beaches close by, near Puerto Portals probably the nicest port on the island. 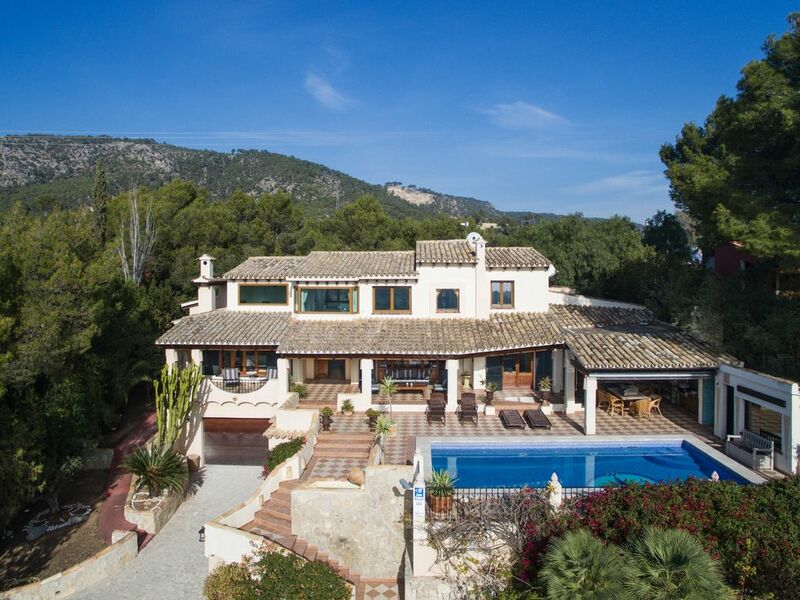 Peaceful and private residential area and only 10 minutes drive to the lovely city of Palma and only 15/20 minutes from Palma airport. 5/6 Bathrooms En-suite bathroom to master suite with bath and shower, seperate wc and bidet. 3 further en-suite bathrooms with showers wc and bidet. Separate bathroom in studio apartment with shower and wc. Separate guest toilet living are. Large dining room with connecting lounge and kitchen. Satellite TV, CD player. Modern kitchen large 30 metre square area, very large central island, bar chairs, gas hobs, electric cooker, double fridge freezer, washing machine, dryer, dishwasher, wine cooler, microwave. Large games room with pool table / table tennis & bar area. Lovely villa in a great location and close to lots of activities. Taxis easy to get into palma etc. The villa was clean, well equipped and plenty of room for everyone. Perfect stay. Great house, very well equipped with everything needed and a great rec room, and with a fantastic view. Thanks Clive for being so helpful and responsive. Villa was ideal for us- group of 9 made up of 3 families including 3 teenagers. Lots of space for everyone, great facilities for indoor/outdoor activity,. Well equipped kitchen and great eating areas especially the outdoor BBQ/eating table. Bedrooms very comfortable and air conditioning very efficient- a must for us when temperatures were over 30 outside. Swimming pool in constant use up to late evening. and not too crowded even when 8 in at same time, although strong or boisterous swimmers might find it a bit restricted, but beaches with sun umbrellas and facilities are available only 15 minutes by car. Loved our stay at Casa Cinderella and waking up to beautiful sea views. Very clean pool which our teenagers loved, but maybe not suitable for those with young children as it shelves very suddenly and deeply. Lovely part of Mallorca, very relaxing. Car definitely needed as walking back up that hill is quite an experience! Games room was very popular with all. Clive was great throughout. Beautiful villa in a stunning setting. You will want for nothing. Clive greeted us at the Villa upon our arrival and provided a guided tour with advice on the local area. Overall the Villa was impeccably prepared and suited our family party of 8, young and old. We would highly recommend this property and it’s owner, should you be considering a stay in the Bendinat area. Our stay was very wonderful. The host was very helpful and was very responsive and thorough. The house is beautiful and has a gorgeous view of the Mediterranean. However, I would recommend having a car as it is somewhat of a hike to get to an from town by foot. The quality and condition of the house is very good and overall it was an amazing stay. Locally there golf, tennis, horse riding & water parks. 5 minutes by car to many beaches and small ports. Palma airport 20 minutes by car. 10/15 kilometres. 2 kilometres Portal Nous and Puerto Portals, 5 minutes by car to Palma. Nearest supermarket 5 minutes by car. Numerous restaurants and small bars 5 minutes by car.